The Houdini cinema and bar faces towards Badenerstrasse and brings together three floors in an open spatial structure unmistakably resembling a “Miniplex”. The five compact movie theaters have a total of 212 seats, the latest projection and audio technology and comfortable seating. From midday to midnight, a varied program is shown daily, which focuses on independent films and upscale movie entertainment. 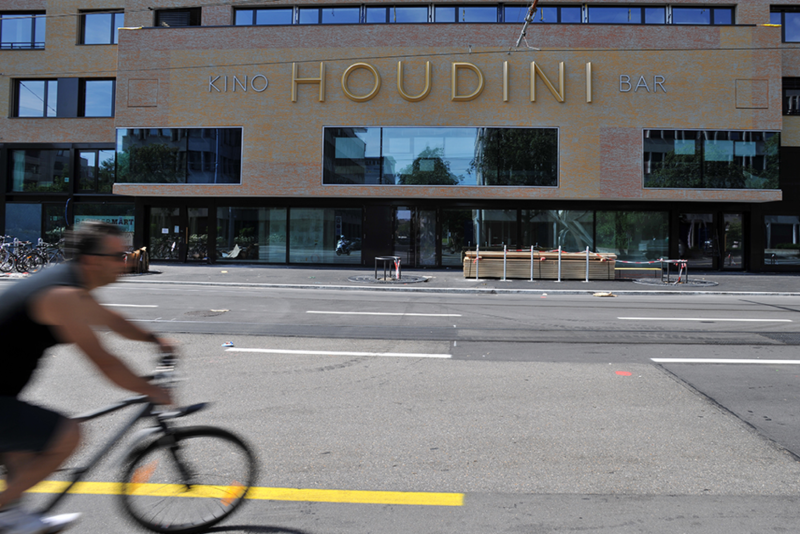 The Houdini Cinema is specifically dedicated to an enthusiastic audience open for cultural discover. Children’s films as well as selected popular titles are shown at the same time as the cinemas in the city center. The Houdini is operated by Neugass Kino AG,which is also runs the Riffraff in district 5. Café Bebek: Restaurant/Café/Bar with approx. 300 seats, daily breakfast until 4 pm, lunch menus and warm cuisine in the evening, mezze or homemade cakes served throughout the day. Felix Bar: A bar for city foxes, connoisseurs, night owls and connoisseurs of perfectly mixed cocktails. Simply Soup: under the motto “eat healthy, be happy”, Simply Soup offers seasonal soups that taste homemade. Take away or eat in. Kevon: Take-away with asian menues. Wohnzimmerbar: parquet floor, drinks and good sound – a small, cosy bar that feels like home. Blex: Hanna Wettstein sells beautifully printed old tin cans and Züri thrillers in the smallest lime-width shop. Making Little Things: Successful on Grüngasse and since September 2012 also at Gerold’s areal, Making Little Things offers sustainably produced clothing for infants and children as well pretty things for children’s rooms. Almog: A young team of goldsmiths opens their first Almog studio and jewelry shop in “Biplane 3”; the precious metals are forged on the upper floor. 90 square meters:For women and men who desire new fashionable discoveries that radiate value quality and individuality. A carefully selected collection of clothing, shoes and accessories. Close ties with the affiliate boutiques in Amsterdam and Istanbul create surprising accents in both the shop and the range of items. BachserMärt: A shop with fresh, mainly organic and regional food. The selection includes fruits, vegetables, dairy products, meat and bread. Blumerei: Annina Rohrer sells seasonal, unconventional bouquets and wreaths as well as a small selection of stationery articles in the studio shop on the courtyard stairs. Thanks the flower vending machine on the premises, customers can enjoy a 24-hour service. Möbel Zürich: The Möbel Zürich shop on the corner of Kalkbreitestrasse and Urselweg sells high-quality furniture and accessories from the second half of the 20th century. All objects are lovingly restored and cleaned. HELSINKI ZÜRICH OFFICE is an international office for architecture, urban development and planning. Diktum.ch: The four-person communications agency primarily caters to NGOs, the public sector and housing cooperatives. Diktum.ch offers know-how and services for campaigns and corporate communication. Office community for communication, web design and architecture: Maude Rivière Communications und Webagentur LOGLAN. Alternative Bank Schweiz (ABS): Alternative Bank Schweiz AG is supported by over 5,000 shareholders. The bank shows a balance sheet total of around CHF 1.8 billion and serves more than 30,000 clients. As a socially and ecologically oriented bank, it refrains from absolute profit maximization and always places its ethical principles in the foreground. Delphys Birthplace: Located on the first and second floor on Badenerstrasse 177, Delphys midwives look after families from the beginning of their pregnancy to puerperium. Among other things, they have two birth rooms with a birth pool and four puerperal rooms at their disposal. Delphys also offers various birth preparation courses and other pregnancy-related services. Psychotherapy Kalkbreite:In the mezzanine at Badenerstrasse 173, Ruth Bourgogne, a federally recognized psychotherapist, runs a psychotherapeutic practice, which integrates art therapy in a painting studio. A practice for children, teenagers, families and adults, individually and in groups. Ophthalmological practice: Anna Fierz runs a small ophthalmological practice at Kalkbreitestrasse 8 on the first floor. More information at www.doctorfmh.ch or tel 044 252 80 65. Complementary therapy & coaching: Located between the guesthouse and the entrance hall, this practice offers solution-oriented short-term consulting and kinesiology to adults, children and couples looking for support during transformational and recovery processes in a comforting atmosphere. Sans-Papiers Zurich point of contact: SPAZ advises and accompanies migrant women without official residence status in social and legal matters. It supports undocumented persons in enrolling their children in school, in buying health insurance and in claiming their basic rights. SPAZ advocates fundamental improvement in the situation of illegal immigrant women and sensitizes the state and the public on the issue of sans-papiers and their precarious life situation. It participates in political campaigns for the regularization of undocumented children and young people and for the rights of sans-papiers domestic workers. Greenpeace Switzerland: The international environmental organization Greenpeace has its Swiss headquarters at Kalkbreite. More than 70 employees currently work on the premises for our ecological present and future. The Kalkbreite Daycare Center resides on the second floor of Badenerstrasse, with direct access to the courtyard and playground. 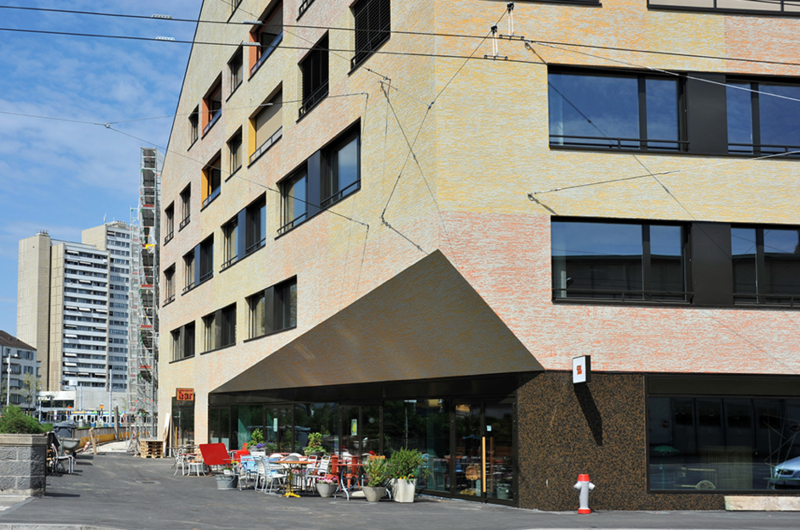 It is run by Diakonie Bethanien who manages four other daycare centers and various social facilities in Zurich. The Kalkbreite Daycare Center offers affordable crèches rates as well as a modern pedagogical concept. 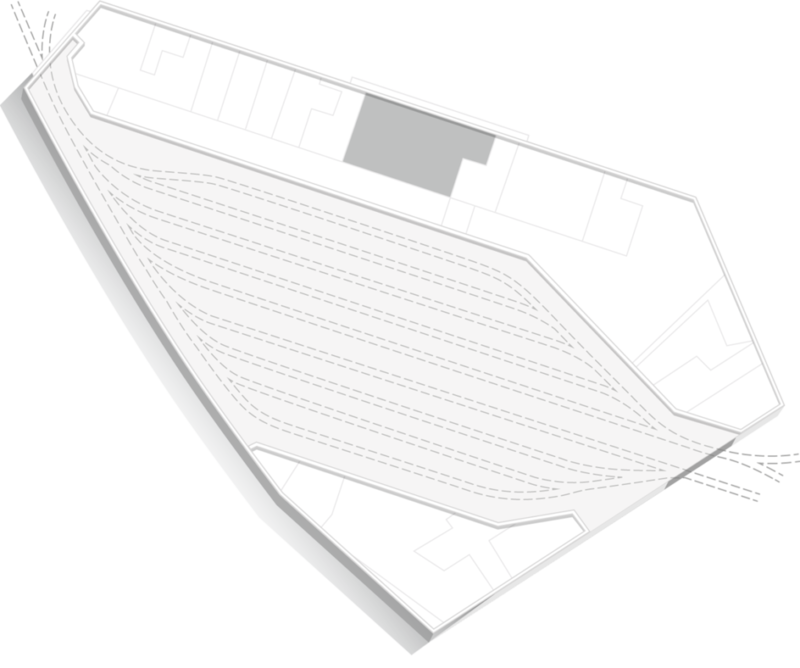 To make use of vacant commercial areas, we offer so-called “work jokers” at Kalkbreite: an office or studio with an area of 16 m2, which can be rented in addition to a residential or commercial property as required. In addition to the spatial flexibility this provides for commercial enterprises, it is also an alternative model for living and working. Work jokers are rented for a limited period of time; the period depends on the need and can last between 12 months and four years, depending on the situation. Work jokers are granted by the rental committee. If it is not used in-house, it can also be leased to third parties under fixed-term contracts, e.g. as a starting base for small companies. Instead of the usual mandatory share capital, the joker tenant pays a deposit.